When cleaning the hard disk, you bump into files and folders that cannot be deleted. You want to know what is blocking access so you can release the files for deletion. Mostly, access by another program is the cause for causing a file to become non-deletable. Windows unfortunately does not provide any information about it. The limit is when you get the message ‘The file is being used by another person or program’. That’s as useless as the message ‘Close all programs that are using this file, and repeat the process’. The free tool UnlockIT (emcosoftware. 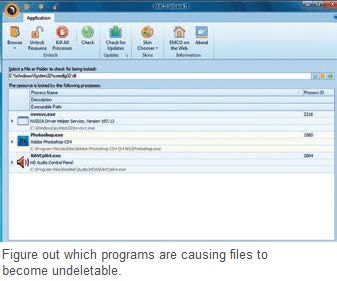 com/unlock-it) determines the corresponding program and enables deleting the specific file. After the quick installation, start the tool. Click the selection arrow under the ‘Browse’ icon and decide whether you want to look into a ‘File’ or a ‘Folder’. Then navigate to the desired entry and confirm the selection with ‘Open’ or ‘OK’. The tool will now show you whether a block exists, and lists the programs that cause it. Check the details so that you do not delete important files. For instance, an open Office document causes even the relevant folder to be blocked. If you want to remove a block, right click the program in the list and try to remove the existing blocks via ‘Close Handles’. This is safe to a large extent as no processes are ended. Only when this doesn’t work should you end the application, which you can do via the ‘Kill Processes’ command in the next step. The element can then be deleted.